Students studying at NYU Shanghai can now qualify for half of the Dance Minor offered at NYU Tisch School of the Arts by taking two dance classes, Dance and Choreography & Performance, at NYU Shanghai. NYU Tisch approved the two courses taught in Shanghai by professor Aly Rose in March, allowing students from across the global network to either start or finish their minor in Shanghai. “This is a great opportunity for students to become leaders, artists, and diversify their skills for whatever careers they choose in the future,” says Rose, former Head of the Dance Minor at NYU Tisch where she taught Choreography, Chinese Dance, and Topics in Chinese Culture. To be awarded a dance minor, students must complete a total of 16 credits in accredited courses, with Dance (ART-SHU 225A-001/225B-001) and Choreography & Performance (ART-SHU 239.4-001/239.2-001) at NYU Shanghai now counting 4 credits each towards the minor. The two courses are already the most popular dance classes on campus, and students now have a new dance studio in the Shanghai academic building to train at. Some of Rose’s students have gone on to hold public performances at some of the city’s biggest arts venues. The entire Choreography & Performance class performed CELL at the 18th International Art Festival Shanghai, while Emma Quong––president of NYU’s ballet club –– Janice Luo and Isabel Adler held performances at MOCA Shanghai in collaboration with Rose’s professional dancers. “Professor Aly Rose constantly shared her professional opportunities with the students. Because of her, I was able to perform at the China Shanghai International Arts Festival Campus Performance and also at the Museum of Contemporary Art Shanghai (MOCA). And through NYU Shanghai, 5 invited students and I were sent to NYU Abu Dhabi to dance at the Body Voices Conference,” added Quong. While NYU Shanghai’s Dance course explores the history and movements of jazz, hip-hop, modern and classical Chinese dance, the Choreography & Performance course teaches students how to create their own work and work collaboratively with others. “They learn how to trust their own bodies, respect and work with one another. Creating a dance vocabulary is very important part of choreography. It’s very exciting for student to have a voice and learn how to express themselves with their body,” Rose said. “Collaborating with other students, professional dancers, and the Chinese arts community I found new perspective to dance and performance. I realized that it is not just about comparing the culturally different end products, but to also understand the importance of their various creation processes,” said Quong. “At the end of the semester we put on a big show in front of a live audience. A lot of them are showing their own work for the first time and for some, dancing for the first time. It’s very impressive because their majors are business, finance, etc,” said Rose. NYU Shanghai students wishing to complete the minor during their study away year can take a combination of the following courses at NYU Tisch: either History of Dance or Why Dance Matters for 4 credits each, and any combination of 2 point Ballet, Modern, African, Flamenco, Hip Hop and Indian dance. This post comes from NYU Shanghai and originally appeared here. 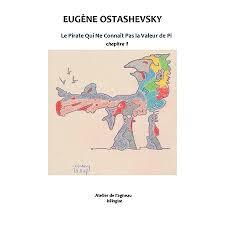 On 2 May, Eugene Ostashevsky, poet, translator, and NYU professor, will discuss The Pirate Who Does Not Know the Value of Pi, his poetry novel about communication challenges in a relationship between a pirate and a parrot who are shipwrecked on a deserted island. The Pirate, just published in the U.S. by the New York Review of Books, has also appeared in French and German translation, the former as Le Pirate qui ne connaît pas la valeur de pi – Chapitre 1. Ostashevsky, himself an award-winning translator from Russian and Italian, will talk about the challenges and opportunities of writing and publishing a creative book, and especially a multilingual one. He will also talk about pirate language, animal intelligence, and other minds. Of course, he will also read passages from The Pirate Who Does Not Know the Value of Pi.